At the BetClic Beach Stadium in Montalto di Castro, the Catanzaro in rosa exceeds the Salernitana Magna Graecia for 3-1 and graduates the Italian Champion 2014. Third place for Res Rome. With 4 goals the Giallorossi beat the Mestre. The fourth edition of the women's championship won the Catanzaro, which passed the Salernitana Magna Graecia for 3-1 in the final. The girls of Luigi Vavalà coached by the beach male Catanzaro Fabio Gentile have mortgaged the title in the first half thanks to the networks of Sabatino and Borello. The Magna Graecia tried to reopen the race with Bertolini but the center of the Bagnato in the last part has definitely closed the games. Success at the first participation for the Catanzaro that in the group had excluded the champions in charge of the Mestre. Catanzaro and Magna Graecia surprisingly beat Res Roma and Mestre, winning the final at the end of two exciting challenges. Both teams hit for the first time in their history the final act excluding the winner and the finalist of the last edition. Two races full of scene shots ended on the line of the siren, two challenges that have exalted the spirit of beach soccer, having fun the public in the stands. Between Catanzaro and Res Roma it was a run up to the last moment with Capalbo who scored the equalizer goal for the Giallorossi a few seconds from the end. The same Capalbo in competitive trance marked the decisive penalty while the number one Modestia has neutralized the conclusion of Ceccarelli. 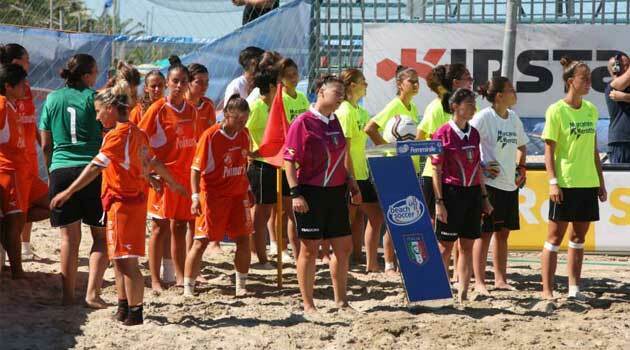 The 2 day of women's beach soccer has decreed the exclusion of the two teams of Terracina reducing the fight for the final in Catanzaro and Res Rome (Girone A), Mestre and Magna Graecia (Group B). The two races today have had a completely different storyline. The debutant Catanzaro has mocked the Lady Terracina just at the end of the time thanks to the scratch of Sabatino (double for her). A match fought until the last moment, only the fate and a bit more grit have allowed the Calabrians to be able to play the final tomorrow against Res Rome. The other race had no history, too strong the champions in charge of the Mestre for a willing but Pro Terracina that the chances of qualification if it was played in the first meeting. The bomber of the last edition Jenny Camilli remained dry-mouthed by chance. It was teammate Vanin who made the big voice and scored poker. Tomorrow decisive challenge of the lagoons against Salernitana Magna Graecia. The first day of women's beach soccer gave the public of the Betclic Arena in Montalto di Castro two races full of goals and twists. The Res Rome, as a year ago, started rocketing beating the Lady Terracina thanks to a capital performance of Cunsolo author of a hat-trick. In the long run the quality of the single capitoline girls prevailed playing in the Serie A of eleven football. The other match was more fought, the Magna Gaecia, who went under two lengths with Pro Terracina, made a prodigious comeback at the end of the second half and ended in 3 'from the end of the race. Determining the center of the Othmani. After the disappointment of the last edition the Salerno start on the right foot. Tomanzaro and Mestre come into play tomorrow and have rested on the first day. Good first for the Res Rome that, in the debut match of the national championship of Beach Soccer, beats 7 to 1 the Lady Terracina. The girls of Mister Melillo start well and close the first fraction ahead for 2 to 0 thanks to a double by Eleonara Cunzolo, best on the pitch for the whole match. In the second of three times the Terracina tries to reduce the disadvantage, but is unlucky and hits two piles. With the passing of the minutes Res Roma back in charge of the field and still goes in goal with the very young Sclavo and Caruso. BEACH SOCCER, THE FEMALE CHAMPIONSHIP STARTS. Beach soccer girls return to the field. You play from 24 to 27 July in Montalto di Castro (VT) with the Italian champion Mestre in charge to beat. Tomorrow 24 July will kick off the national beach soccer championship 2014. The setting for the event will be the beach of Montalto di Castro, a town in the Viterbo area with a deep historical and landscape value. For the second consecutive year the Beach Soccer Department of LND has renewed its commitment to football on the beach in pink, thanks to the great media and public success obtained last season when the girls of the Mestre climbed for the first time on the roof of Italy in the final won for 4-1 against Res Roma in San Benedetto del Tronto. 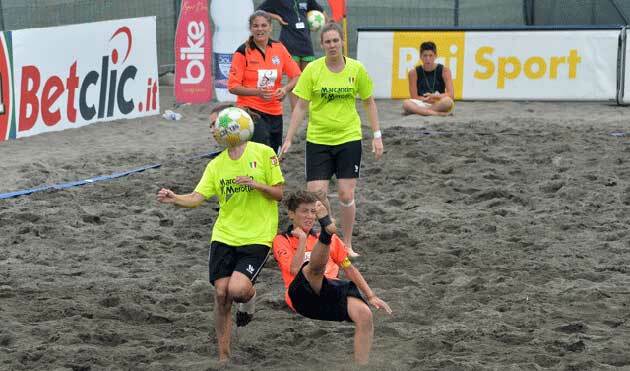 Read more: BEACH SOCCER, THE FEMALE CHAMPIONSHIP STARTED. 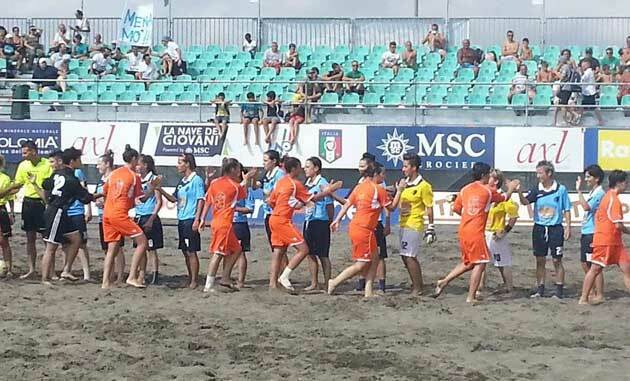 RES ROMA, THE CONQUEST OF THE BEACH SOCCER! 24 July, the 2014 Women's Beach Soccer Championship starts tomorrow, with 6 teams at the starting line for the conquest of the Italian flag, last year finished on the jerseys of Mestre. The Res Roma, vice-champion of Italy in charge, has been included in group A together with Lady Terracina and Catanzaro, while in group B Salernitana, Mestre and Pro Terracina have been included. The Giallorossi will debut at 16.30 against Lady Terracina, and then return to the field Saturday at 10 against Catanzaro. The winners of the two groups will play the final Sunday 27 July at 12, while the second two ranked in each group will play the third and fourth place at 11, also the 27 July. 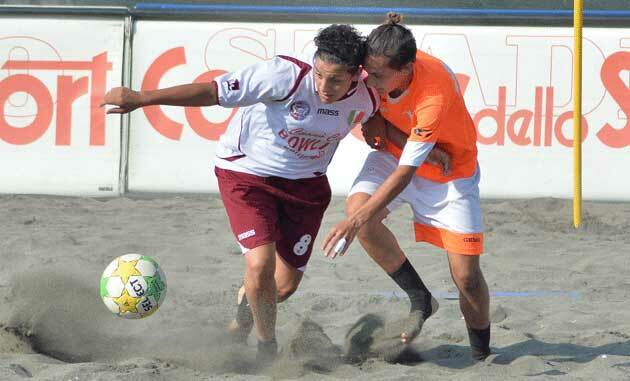 Read more: RES ROMA, THE CONQUEST OF THE BEACH SOCCER! 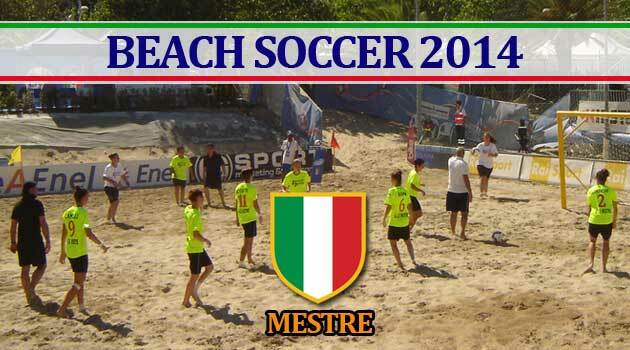 The second edition of the National Beach Soccer Championship will take place in a single concentration in Montalto di Castro (VT) from 25 to 27 July with the Mestre to defend the tricolor title won a year ago in S.Benedetto del Tronto. Unveiled the teams admitted to the tournament, together with the defender Mestre, we have: Catanzato women, Lady Rome, S.Magna Graecia, Pro Football Terracina and Res Rome. The six teams are divided into two groups. In group A: Catanzaro, Lady Roma and Res Roma: in group B: Mestre, S.Magna Graecia and Pro Calcio Terracina. BEACH SOCCER 2014: THE RES ROME THERE IS! Also this year Res Roma will participate in the national championship of Beach Soccer, organized by LND; the Giallorossi of Mr. Melillo are the vice-champions of Italy in charge, and this year will try to conquered the Italian flag, toned in the summer thanks to the Mestre, who had the best in the final game in San Benedetto del Tronto. Also in this edition there will be eight teams at the start, and the capitals will be merged in the first round with other teams from the center - south: the precise formula and the dates will be announced in the next weeks by the Beach Soccer department of LND, but most likely the girls of Mr. Melillo will be engaged in June in the qualifying stage, and in July in the eventual Scudetto final. 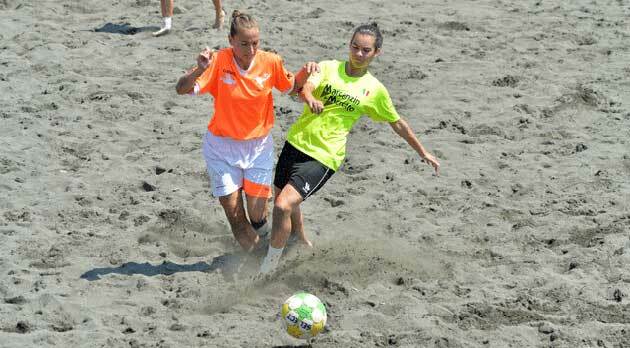 Read more: BEACH SOCCER 2014: THE RES ROME THERE IS! The National Amateur League - in implementation of the provisions of art. 23 of the LND Rules and through its Beach Soccer Department - index and organizes, for the 2014 calendar year, the 2014 Series A Beach Soccer Women's Championship. The Championship will be divided into two or more groups: one or more Groups reserved for teams from the Center-North and one or more Groups reserved for teams from the Center-South and Islands. Each group will consist of at least three / four teams each. The rules for conducting the Championship are as follows: each Group will play a unique stage, valid as a qualifying round to the final stages, concurrent with a stage of the National Men's Championship Series A. All races will be held in the morning or in some cases in the afternoon. The regulatory procedures are contained in the article 8 of this Official Communiqué.